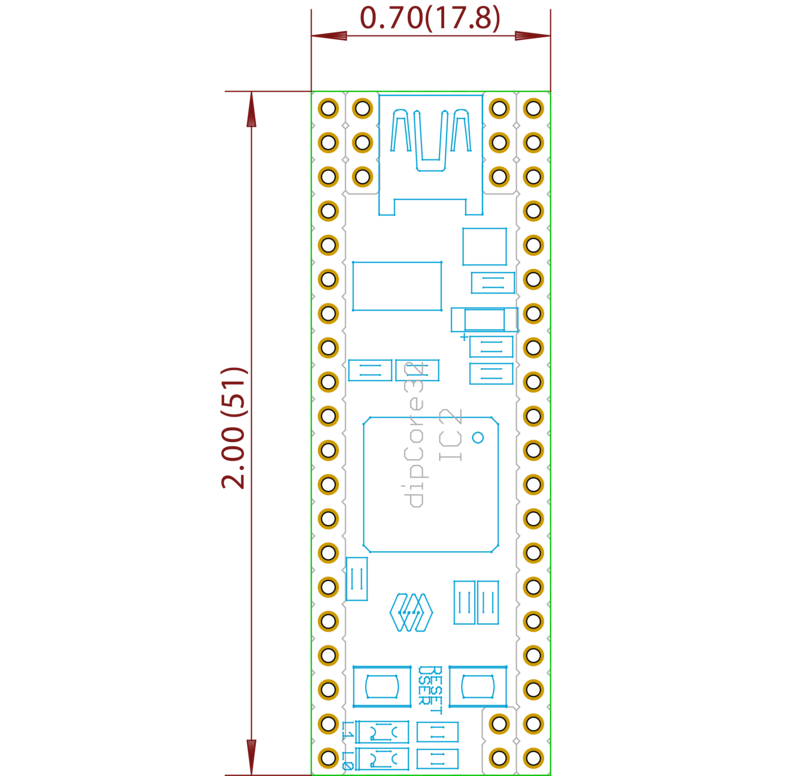 dipCoreF4 and dipBoardF4, a compact Core. This is about a new STM32F4 mbhp, a very compact one. I tried to draw the most compact core and mbhp board. It's an STM32F405RG instead of the regular 407VG. The 405RG is the smallest package of the M4 Series, this is a LQFP64, a 10x10mm package with only 64 pins. Because these two Processor are from the same family, we don't need deep changes in MIOS32. They have exactly the same functions, memory, speed and peripherals. I put the STM32F4 on a DIP-40 format pcb, in order to get a core that can also replace a PIC in some application, I strongly think of my sammichSid. At the same time it must provide the legacy functions and ports of MIOS32 of course. Some compromise have been made in comparison to a 407VG mbhp. - Only 2 MIDI I/O. - J15, the LCD port is now a serial one only(SSD13xx). - No more general purpose port J10x. This is the list of the 'remaining' ports and changes. - J1A and J1B are the USB and Power ports, J1A is compatible with latigid on's USB wCore module. J1B can be a common header on top or a Micro-Match connector on bottom to stack another board under. - J4 is a dual I2C connector, I put both on the same connector to save space. - J5 is a 2 channels only ADC, they can be used for expression pedal input for example. - J11 is now a 6pin and 2 MIDI I/O port. 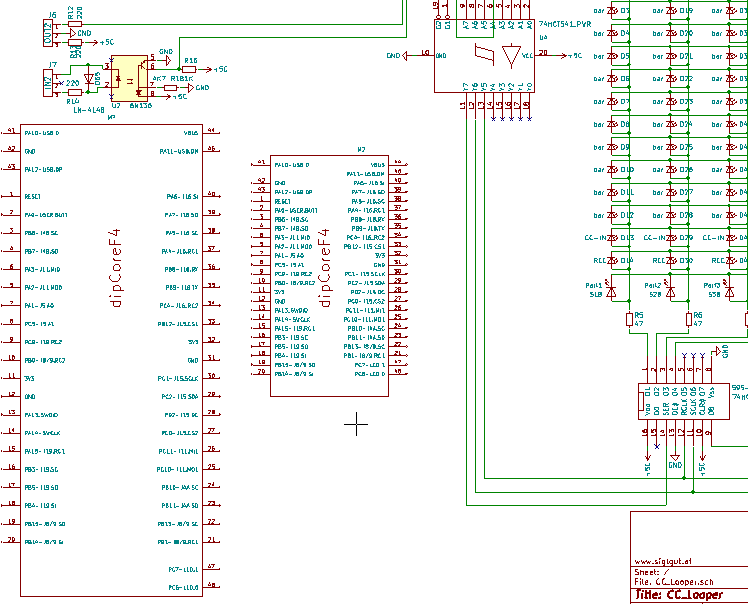 - J16E is the 3.3V SPI port, commonly dedicated to the SD Card it is compatible with latigid on's RES-SD modules. it is extended by the Reset input, the user button and 2 outputs for LEDs. - J18 has changed, it is now able to connect a CAN tranceiver, but stay compatible with the MBNET connection. About the dimension, the ensemble is very compact 65x46mm, but the Core can be used alone and measures 51x17.8mm. Feel free to ask me question or give me any constructive criticism. This is the eagle lib for the dipCoreF4, it will be easier to integrate in your design. This is really nice. It's looking good so far. Someone else is interested to test this Core? I'm in holidays and I want to order the boards quickly. NB: A Discovery can flash it onboard. 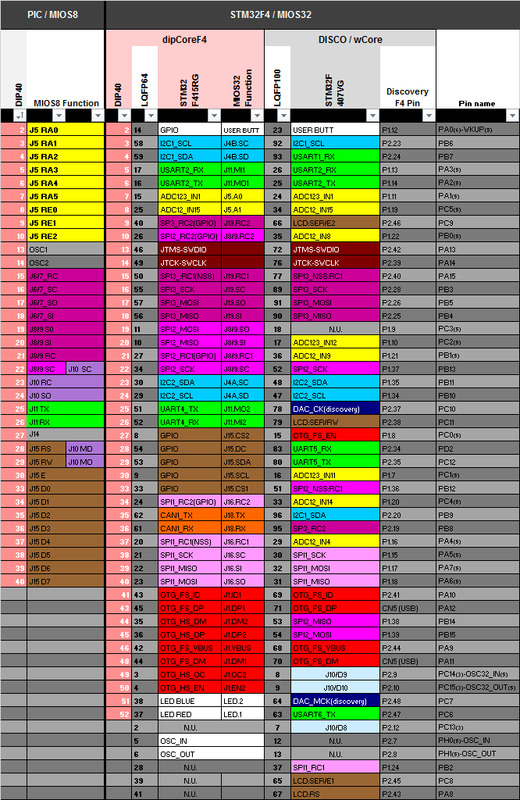 SWDIO and SWCLK are on the DIP40 pin 13 and14 (old xtal IO). 2*dipCoreF4 + 1*dipBoardF4 is fine for you? Think to set 3V3 Power supply pins as Output type! To avoid any mistake. VBUS(5V) is an Input type of course. ok, done i replaced the file above. the DIP-CORE is made to be Powered Up by micro USB only - so: i dont need to integrate a Power-Jumper anywhere in my Design? For easier routing PB2 was replaced by PA4, in MIOS32 side also. Not USB only, you can use external 5V connected to VBUS on Pin44 or on J1A or J1B of dipBoardF4. PB2 > PA4 = SD-Card Dat3 >>> OK thx for INFO.
? where to take +5V on the DipCore32 - to powering for example 165/595 registers? - you sayd VBUS is input, so i assume i dont get it from there? you have to make then two seperate planes for your connected Components like "+3,3a" and "+3,3b"
From the same external source where you connect VBUS of the dipCoreF4, Simply see it like a component, you've got to supply it in 5V and it will provide you the 3.3V. The Core is the 3.3V regulation too(this is not different to the others cores). Remember, there's a 74HCT541 onboard, all J8/9 and J19 output pins are in 5V. Usually this level shifter is on the mbhp, but here the Core is dedicated to MIOS32 then I put the 541 directly on it. You can't internally connect to physical pins to the same signal? 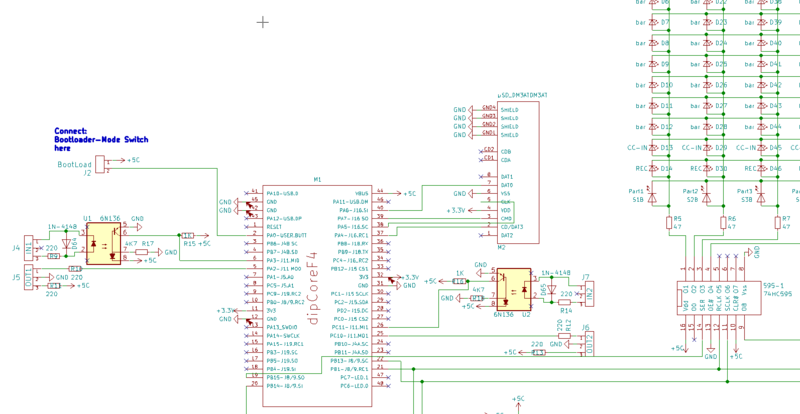 Strange, but I can't help on this, I don't know Kicad. From the same external source where you connect VBUS of the dipCoreF4, Simply see it like a component, you've got to supply it in 5V and it will provide you the 3.3V. i know that the HCT541 is onboard, i already connected the 165 and 595 datalines...that was no problem. * i dont use a Dip-Expansion-Mother-Board - i plug the DipCore into a UI-PCB where all shiftregisters and all other components are already on it. Between VBUS and internal +5V there's a PTC fuse F1 which protect VBUS from over-current. You can use VBUS(Pin44) as output and supply your App PCB from dipCore USB. But F1 will not protect VBUS from your APP board 5V load. I didn't think it like that, in your case, you will design a dedicated box for your CC looper UI-PCB then you will put an USB connector or an external power somewhere on that box. And in this case you're not obliged to use and solder the dipCoreF4 USB. The dipCoreF4 is like a component and your UI-PCB provides the 5V to it. Between Your App USB connector and pins 46/43 some rules are usually followed to preserve differential pair DM/DP. USB signal pair traces should be trace-length matched. USB 2.0 Full speed (12Mbps) can survive a 1mm difference. Avoid 90° angle in trace. I used to round it a little bit. * on the dipcore is a usb-socket - but you dont want to power the dipboard with that USB (and all J8/9...). 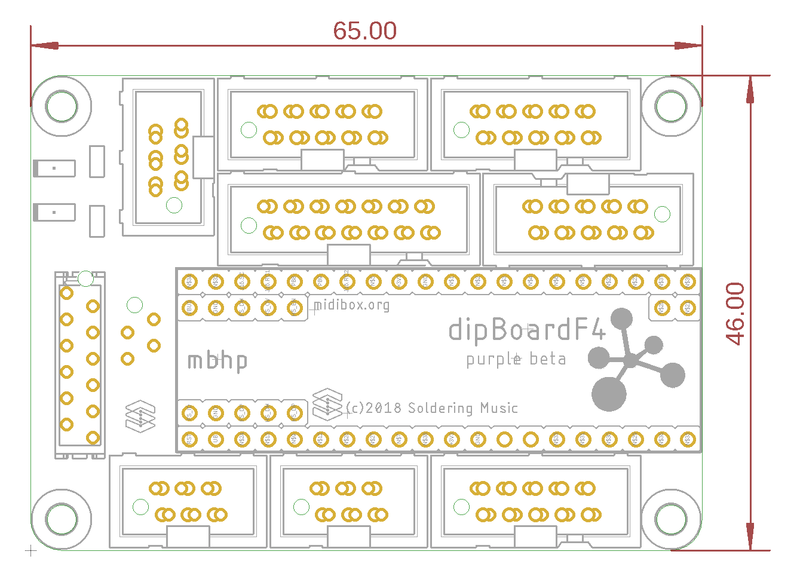 * on the dipboardf4 is no usb-socket - and you power your modules and the dipcore with dipboard, the 5V you need - you get from a Walladapter connected to Pinheader... or you wire a external USB-Modul on dipboard (but as you wrote, the usb dont get better over 10angels...) . will solder a wire to R3 and connect it to my motherboard, nasty, but when i read your shematic right - it will do the the job. I do not see what is the point, when I have the same voltage on VBUS or somewhere outside and it makes me loose some pin. Humm, yes but this is not a primary features, this is sized for MIOS32 before everything. Using the dipcore in an existing mios8 app will obviously need some adaptation, put I tried to make sure to have the least to do. Of course you can power the dipboard with that USB, I add another PTC Fuse on the dipBoard for that specific configuration e.g. in development mode. Yes like any existing 32 bit mbhp. i just add a ptc"fuse" on my design. so i can use vbuspin44 of dipcore to power the shiftregisters with no troubles. since i need a few Extra LEDs to light up the UI, i was searching for the Onboard GPIO - i found PC6+PC7 > perfect. > since i will be ready soon with the cc_looper - will order Protoboards for it the next days - i assume nothing changed on the Pinout of the DipCore until now > so i can order?